Catch a Trout: To eat trout, you have to catch one first. A 2 to 4 pound trout is usually the best size to bake. 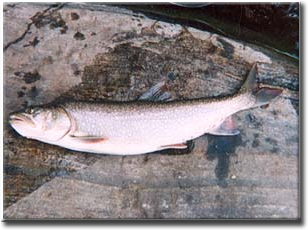 Trout that are bigger should be let go as they are the breeders and do not taste as well. Cut the head off and gut the fish: These pictures were taken on the shore. I had to clean these fish on a rock so it should be much easier for you to do this on a fish cleaning table. Butterfly The Trout: Here is where we start to butterfly the trout. 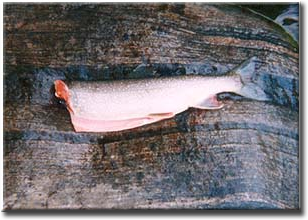 Turn the trout upside-down so the stomach is facing up. Turn your knife upside-down so the blade is facing up. Slide your knife in along the backbone (at the base of the rib cage) and cut up so that your knife slides up along the outside of the rib cage. 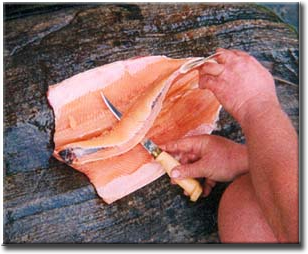 Then turn your knife over and cut down along the backbone. You have to cut through a ridge on bones that we take out later. When you cut down, don't cut through the skin. 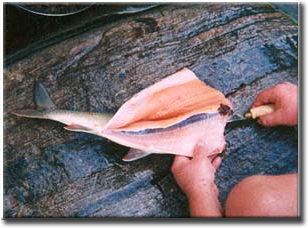 Cut down to the skin and cut along the whole lateral of the fish right to the tail. Do the same thing on the other side of the fish so that you have the two sides of the fish laying flat and the rib cage structure is in the middle but clear of the meat. Then turn your knife sideways and cut along the base of the meat and remove the bone structure. Now you have a butterflied trout. There is still two rows of bones to take out. With your fingers, you can feel the row of bones that you cut through earlier. Just slice these bones out by cutting along the bones on both sides. Don't cut through the skin. Get a big piece of heavy duty tin foil. 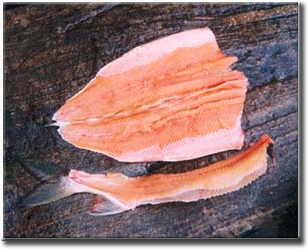 Smear butter over an area which is the same size as the trout. Sprinkle salt, pepper, lemon juice and lots of poultry seasoning on the butter. 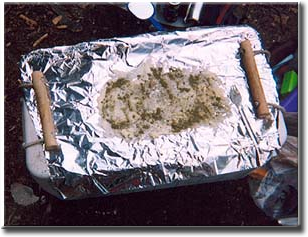 Then place your trout (skin down) on the butter which is in the middle of your tin foil. When you are in the bush, the most convenient stuffing to bring is Stove-Top Stuffing. Get the regular stuffing for turkey or chicken. When we follow the directions to make the stuffing, we substitute some of the water needed with lemon juice. We also make the stuffing a little dryer so it absorbs some of the moisture from the trout. Sprinkle some more salt and pepper right on the trout meat and then cover half of the trout with the stuffing. 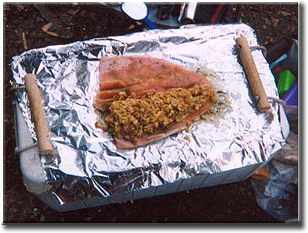 Fold the other half of the trout over the stuffing. 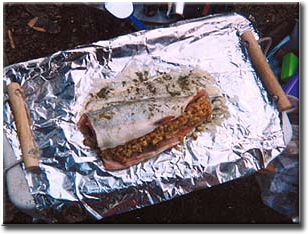 Then wrap the trout up in the tin foil. What I do is roll the trout in the tin foil and then roll up the two ends so it's air and moisture tight. You don't want the butter to run out on you. Place the trout on the grill. Don't have the trout close enough to the fire that it burns but you do want it to be hot. I would say you want the same temperature as a propane BBQ on low. If you can hear the butter boiling, then you have good heat. If the butter stops boiling, it's either too hot and has burned away or too cool. If cooking in an oven, pre-heat oven to 350 degrees. 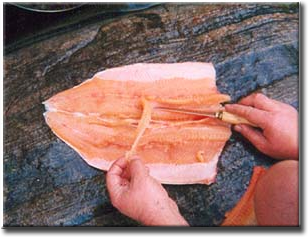 After you have rolled up the trout, you have to measure its thickness. Cook for 10 minutes plus an extra 10 minutes for each inch of thickness. If you stuff a 4-pound trout, it will be about 3 inches thick so you would cook it for 40 minutes. 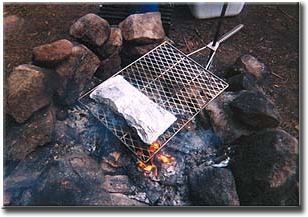 Cooking over a fire: For a 4 pound trout, cook the trout for 40 minutes. You need to flip the trout every ten minutes. After 40 minutes, you can place the trout off to the side while you cook some steaks, which by the way, goes great with baked trout. 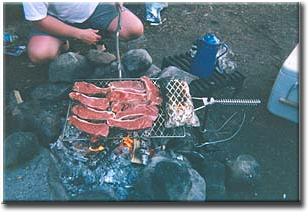 At this time, the trout is cooked but it's OK to keep it warm by the fire for another ten minutes while you cook other stuff. When it's done, cut away the tin foil and then pull off the fins and the back fin. Then you have a boneless baked trout that's ready to eat. You don't always have to use Stove Top Stuffing. Get a bottle of Kraft Sun-Dried Tomato & Oregano salad dressing. Let the bottle settle so all the oil floats to the top. Then squeeze the bottle until all the oil is out. This is messy but you have to get the oil out. Then pour what's left on a cheese clothe and drain the spices and tomato chunks out of the liquid. Then spoon all the spices from the dressing onto the trout and then put a generous helping of Parmesan cheese on the inside of the fish. Roll it up and bake it. We call this Pizza Trout and it's awesome. Another good way to bake a trout is to chop up an apple and a large white onion and put into a pan and fry with some salt and butter. After you have saut�ed the apple and onions, place the apple / onion mix on the trout and then put a big chunk of cheddar cheese on top and roll it up and bake it. These methods can be used for any kind of trout or do the same with Walleye or Smallmouth Bass Fillets. 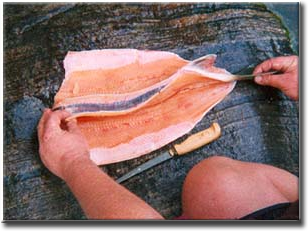 You can do this with Rainbow Trout or West Coast Pacific Salmon. Don't use salmon from the Great Lakes because they taste like cardboard. They are totally different from salt-water salmon. Just remember that a bigger fish has to be cooked longer at lower temperatures. To the right is Steve Howlett holding a baked, stuffed Lake Trout.